Please select the correct Adjectives, Nouns and Verbs to complete the sentence. 1. He (VERBS CARD 53) his (ADJECTIVES CARD 10) (NOUNS CARD 1) to study yesterday. 2. The (NOUNS CARD 70) (VERBS CARD 51) no (ADJECTIVES CARD 6) (NOUNS CARD 12) on that day. 3. 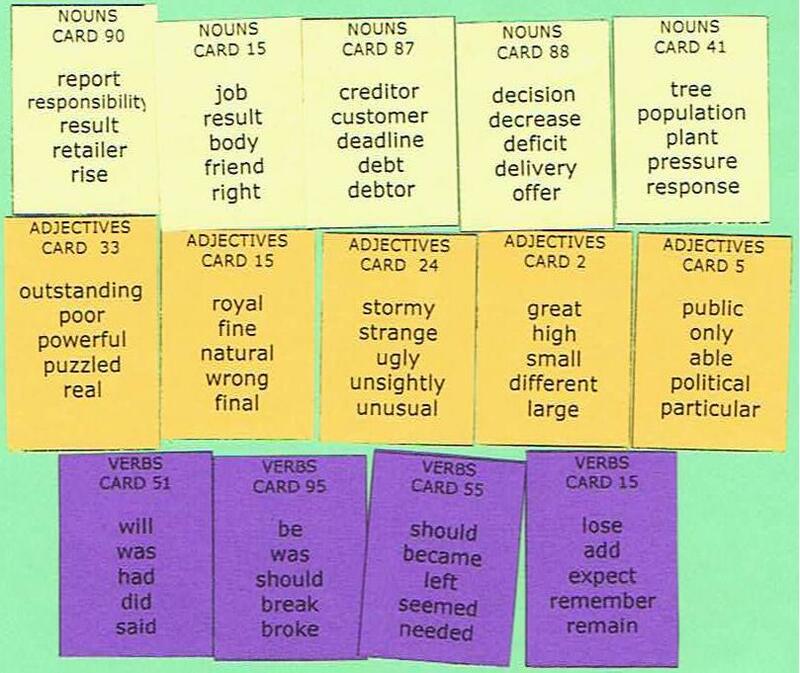 He (VERBS CARD 95) (ADJECTIVES CARD 50) to (VERBS CARD 1) into the burning (NOUNS CARD 6) to save a (NOUNS CARD 71). 4. 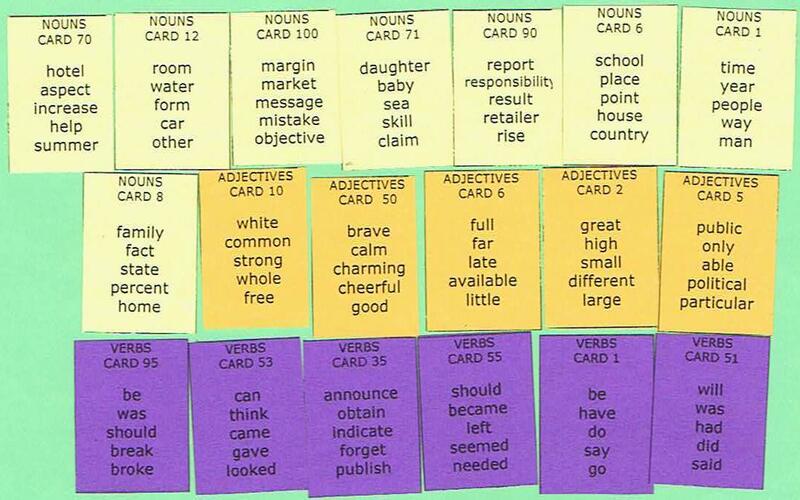 (VERBS CARD 35) such a (ADJECTIVES CARD 2) (NOUNS CARD 100). 5. I (VERBS CARD 55) my (NOUNS CARD 90) at (NOUNS CARD 8) on that (ADJECTIVES CARD 5) day. 6. They were not (ADJECTIVES CARD 8) which (NOUNS CARD 1) to (VERBS CARD 2). 7. The (NOUNS CARD 5) next (NOUNS CARD 7) (VERBS CARD 91) (VERBS CARD 95) for (ADJECTIVES CARD 12) people only. 8. I (VERBS CARD 4) it (ADJECTIVES CARD 34) to attend the (NOUNS CARD 5). 9. 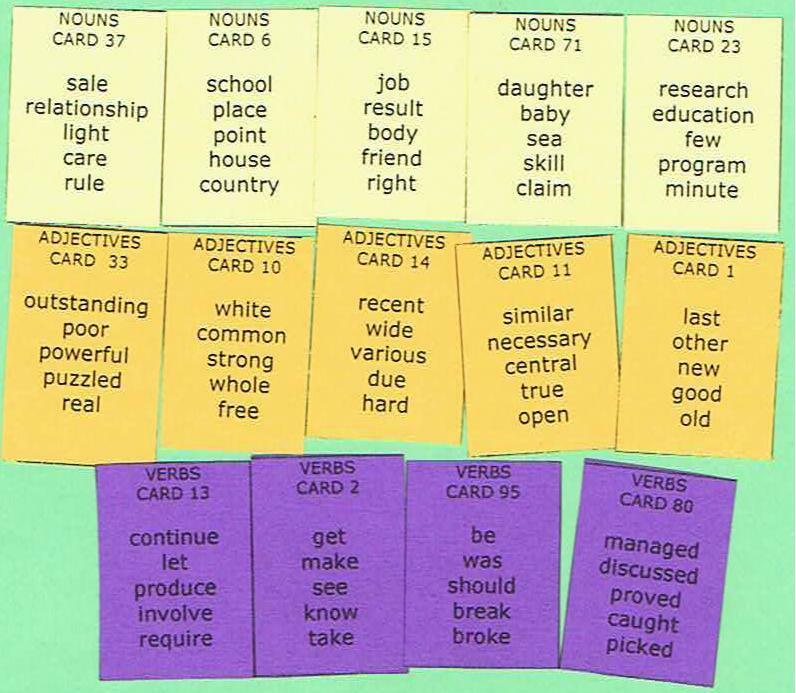 Do you (VERBS CARD 1) any (ADJECTIVES CARD 1) (NOUNS CARD 10)? 10. 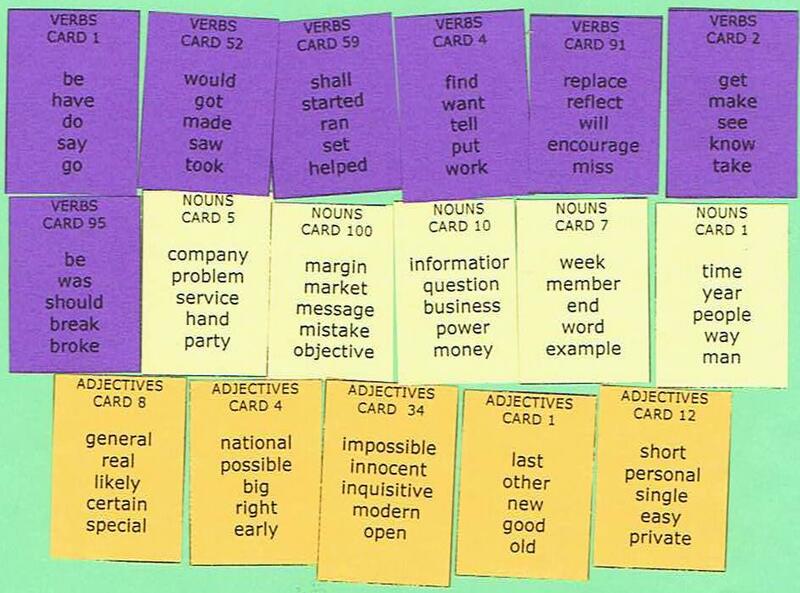 I (VERBS CARD 52) a spelling (NOUNS CARD 100), but he (VERBS CARD 59) me (ADJECTIVES CARD 4). 11. It was (ADJECTIVES CARD 24) that no (NOUNS CARD 15) (VERBS CARD 95) at home. 12. (ADJECTIVES CARD 5) two weeks are (VERBS CARD 55) until the (NOUNS CARD 87). 13. The athelete's (NOUNS CARD 90) of last season (VERBS CARD 95) (ADJECTIVES CARD 33). 14. The manager (VERBS CARD 51) a responsibility for the (ADJECTIVES CARD 15) (NOUNS CARD 88). 15. In this island which has a (ADJECTIVES CARD 2) (NOUNS CARD 41), a lot of nature still (VERBS CARD 15). 16. Sometimes we (VERBS CARD 80) a (ADJECTIVES CARD 33) (NOUNS CARD 15) for different cultures. 17. For this position,a good communication (NOUNS CARD 71) (VERBS CARD 95) (ADJECTIVES CARD 11). 18. I often (VERBS CARD 2) my classmate studying at the library. That's our (ADJECTIVES CARD 10) (NOUNS CARD 6). 19. Building a (ADJECTIVES CARD 1) (NOUNS CARD 37) with our customers will (VERBS CARD 13) more profit. 20. A (ADJECTIVES CARD 14) (NOUNS CARD 23) (VERBS CARD 80) that people want to spend more time with their families. The Sentence Master word cards can be used as an English language: game, quiz, exercise, assignment, test, exam, puzzle, competition, practice questions, practice problems, skill assessment or evaluation tool. The Sentence Master word cards can also be used as a basis for English language vocabulary practice, learning new vocabulary, discussing English language context, comparing and contrasting vocabulary and meaning in sentences. Link to Sentence Master English grammar 2, 3 and 4 Word Card writing exercise answers. Practice your English with friends, family and classmates. Play writing games and have fun while learning. Use the practice word cards to create millions of English sentences, clauses and phrases. You can buy the Blueprint for English eBook which includes the practice word cards and download it right away at Lulu. Use this link - Yes it is faster and cheaper and includes more. You get: SentenceMaster Conjunction Cards, Article Cards, Verb Cards, Noun Cards, Pronoun Cards, Preposition Cards, Adverb Cards, Adjective Cards and some free bonus word cards.